Natalia Leigh read 37 books of her goal of 30! Natalia Leigh graduated from Colorado State University with a bachelor's degree in English and a concentration in Creative Writing. Natalia worked as an English tutor out of college and now enjoys assisting her clients with their own fictional works, as well as sharing her writing experience on her YouTube channel. When not writing, Natalia can usually be found caring for her many pet-sitting clients, honing her practice on a yoga mat, or staring out a window at her favorite coffee shop. Song of the Dryad is her third novel. To ask Natalia Leigh questions, please sign up. What do you advice new authors of promoting their books for readers out there? SONG OF THE DRYAD is a stand-alone Young Adult fantasy with elements that will appeal to fans of Maggie Stiefvater’s THE RAVEN CYCLE. We’d love your help. Let us know what’s wrong with this preview of Big Magic by Elizabeth Gilbert. We’d love your help. Let us know what’s wrong with this preview of Love on Her Own Terms by Carol Colyer. 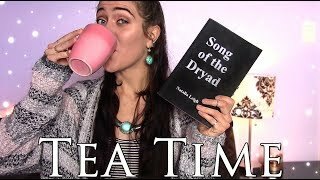 "Song of the Dryad is a contemporary fantasy from author Natalia Leigh that draws inspiration from fae/fairy mythology. We’d love your help. Let us know what’s wrong with this preview of Song of the Dryad by Natalia Leigh. This book was so whimsical and a solid Fantasy story. Weekly TBR challenges, read-a-longs, and book related chats.